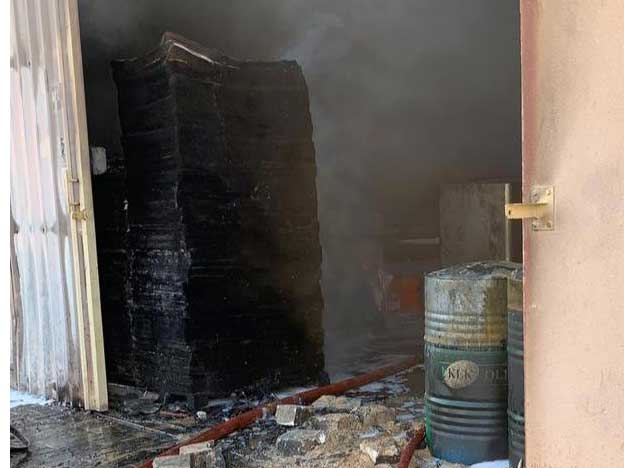 Ajman: An worker died and four others were injured in a fire that broke out in a perfume warehouse in Al Jurf Industrial area here on Saturday night. Lieutenant Jamal Hassan Jamel, Civil Defence officer on duty, said the fire caused extensive damage to property. The sole fatality was identified as an Egyptian man, who died on arrival at the Shaikh Khalifa hospital. He died of smoke inhalation, the official said. The fire broke out in the warehouse containing flammable materials. Firefighters from Ajman were brought in to control the blaze. “We immediately took the necessary measures to prevent the fire from spreading,” Lt. Jamal said. The official said that the quick response of Ajman civil Defence helped save the lives of four other staff, described as all African, who were trapped inside the factory. Ajman Civil Defence, along with Ajman Police worked, in tandem to control traffic movement in the area, evacuating shoppers, shop owners and workers from the risk zone. Once the situation was brought under control, the site was handed over to forensic experts to determine the origin and cause of fire. The African workers sustained minor to medium injuries. They were all transferred by the emergency workers to Shaikh Khalifa hospital for treatment. The fire started at the main entrance, which prevented the trapped workers from escaping the premise. The rescue team stormed the fire directly to evacuate the warehouse and rescue the trapped staff and prevent the fire from spreading to other warehouses. Brigadier Mohamad Ali Al Suwaidi, Director of the Civil Defense Centers Department, said emergency exits should be kept free of items. He appealed to the owners of the warehouses to keep entrance and emergency exits clear and remove any materials blocking the movement of people. He also urged them to apply safety requirements and periodically make sure from the safety of electrical conductors in addition provide the premise with fire extinguishing equipment.